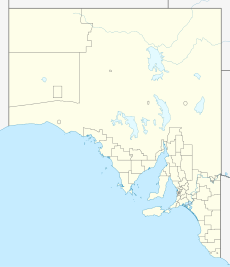 Beachport is a small coastal town in the Australian state of South Australia about 311 kilometres (193 mi) south-east of the state capital of Adelaide and about 34 kilometres (21 mi) north-west of the municipal seat in Millicent, located at the northern end of Rivoli Bay. Beachport has a large crayfishing fleet, and is known for its 772-metre (2,533 ft)-long jetty, the second-longest in South Australia after the one at Port Germein. Following the discovery and naming of Rivoli Bay in 1802 by French navigator Nicolas Baudin, a whaling station was established[where?] there in the 1830s. The whaling industry soon declined, to be followed in succeeding decades by European pastoralists settling in the hinterland. Whaling was then superseded by a booming wool export industry, leading to the need for a port. The town was named on 23 May 1878 for the then British Secretary of State for the Colonies, Michael Hicks Beach, 1st Earl St Aldwyn. Beachport is the location of what are believed to be the first casualties of World War II on Australian soil. On 12 July 1941, a local fisherman discovered and towed to Beachport a German sea mine, laid either by the raider Pinguin or the minelayer Passat. The following day, two able seamen, Thomas Todd and William Danswan, part of a three-man Rendering Mines Safe (REMS) team, were killed when a wave lifted the mine and caused it to explode on the beach while they were attempting to defuse it. A monument now stands in the town to honour them. Beachport was officially proclaimed a port on 21 November 1878. In the same year a lighthouse was erected close by on Penguin Island and a railway from Mount Gambier was completed. A wool and grain store was built in 1879, served by the railway, thereby providing a facility to link the export trade by rail and sea. The railway closed in 1957. The old wool and grain store has been preserved and today serves as a National Trust museum. Popular recreational fishing spots include the Salmon Hole, jetty and 10 Mile Beach. Other attractions include the Salt Lake, Lake George and the rugged coastal views of the Scenic Drive. The nearby Beachport Conservation Park, which includes 710 hectares (1,800 acres) of beaches, rocky headlands and boobialla scrub, overlaps with the much larger Lake Hawdon System Important Bird Area. In the sandhills adjacent to Beachport is the Pool of Siloam, named in allusion to the Biblical Pool of Siloam. Said to be seven times saltier than the ocean, it is enjoyed by swimmers and has related amenities. ^ a b c d e f "Search results for 'Beachport, LOCB' with the following datasets being selected - 'Suburbs and Localities', 'Government Towns', 'Counties', 'Local Government Areas', 'SA Government Regions', 'Railways' and 'Gazetteer'". Location SA Map Viewer. Government of South Australia. Retrieved 16 May 2018. ^ Australian Bureau of Statistics (27 June 2017). "Beachport (State Suburb)". 2016 Census QuickStats. Retrieved 16 May 2018. ^ Australian Bureau of Statistics (27 June 2017). "Beachport (Urban Centre)". 2016 Census QuickStats. Retrieved 16 May 2018. ^ Morgan, William (23 May 1878). "Untitled proclamation re the Town of Beachport" (PDF). The South Australian Government Gazette. South Australian Government. p. 1257. Retrieved 15 May 2018. ^ a b c "Postcode for Beachport, South Australia". postcodes-australia.com. Retrieved 8 April 2019. ^ "Search results for 'Beachport Railway Station' with the following datasets being selected - 'Suburbs and Localities', 'Government Towns', 'Railways' and 'Gazetteer'". Location SA Map Viewer. Government of South Australia. Retrieved 8 April 2019. ^ "District of MacKillop (map)". Electoral Commission SA. Retrieved 8 April 2019. ^ a b c "Monthly climate statistics: Summary statistics ROBE AIRFIELD (nearest weather station)". Commonwealth of Australia , Bureau of Meteorology. Retrieved 8 April 2019. ^ "Former Beachport Customs House". South Australian Heritage Register. Department of Environment, Water and Natural Resources. Retrieved 26 August 2016. ^ "Beachport Museum (former Wool and Grain Store)". South Australian Heritage Register. Department of Environment, Water and Natural Resources. Retrieved 26 August 2016. ^ "Beachport Jetty". South Australian Heritage Register. Department of Environment, Water and Natural Resources. Retrieved 26 August 2016. ^ South Australian Department for Environment and Heritage Archived 6 September 2007 at the Wayback Machine. ^ "Important Bird Areas factsheet: Lake Hawdon System". BirdLife International. 2014. Retrieved 27 October 2014.